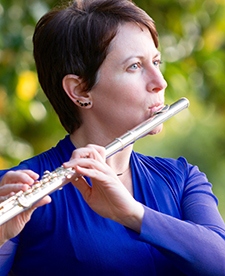 Prize-winning flutist Suzanne Snizek has a dedicated practice of bringing lesser-known and previously suppressed music to the concert stage. In a noon-hour Faculty Concert on Tuesday, October 9, Dr. Snizek will present a rare selection of music by Czech, Korean, Jewish and Soviet composers. The concert will be rich in quality, diverse in musical styles and includes challenging solo flute pieces by Korean composer Isang Yun and Soviet composer Edison Denisov. “Both works are highly expressive although the styles differ greatly,” says Snizek. She compares Denisov’s writing to that of Shostakovich’s “angularity and melancholy, with hints of humour,” while Yun’s work is explosive and daring and challenges the flutist to play at the extreme ranges of dynamics and colour. Her concert was previewed in this October 4 Times Colonist article. Snizek is an expert in suppressed music, has published on the topic and performed this repertoire extensively. She is the 2017 REACH award recipient for Excellence in Creative Expression at UVic, where she recently recorded her first CD devoted to suppressed music, titled Chamber Music (Re)Discoveries. Guest pianist Yoomi Kim will join Snizek in works by Sylvie Bodorová and Gunter Raphael. A Jewish composer who survived the Holocaust, Raphael’s music suffered as a result of the political suppression he experienced during that time. Kim is a pianist, conductor, composer and teacher at the Victoria Conservatory of Music. The Faculty Concert Series featuring Suzanne Snizek (flute) and Yoomi Kim (piano) runs from 12:30–1:20 pm Tuesday, Oct. 9, in the Phillip T. Young Recital Hall in UVic’s MacLaurin Building B-wing. Admission is by donation.